Adult apterae of Ericaphis ericae are green or brownish green with the tips of the antennae and legs black. It is a small species with a body length of 1.1-1.7 mm. 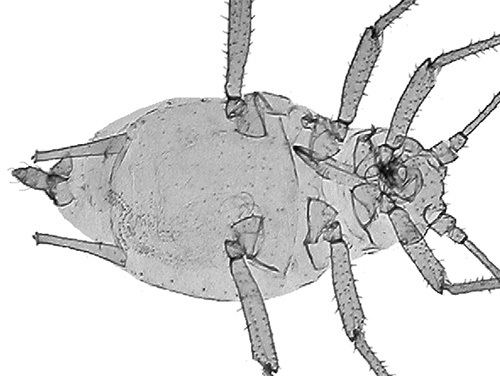 The hairs on the third antennal segment are conspicuous (although sadly not on our micrographs of Ericaphis ericae in alcoohol), the longest of these hairs are 0.6-1.0 times the basal diameter of that segment. 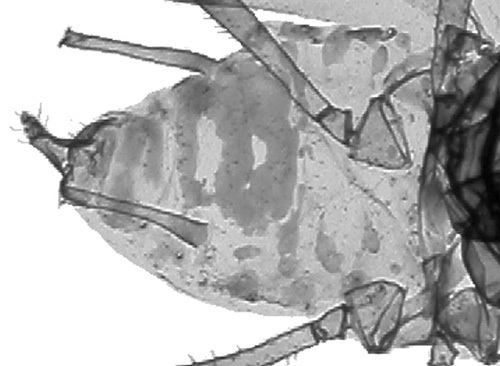 The fused last two segments of the rostrum are 1.3 to 1.7 times longer than the second hind tarsal segment (see second micrograph below). The first tarsal segments usually have three hairs. Ericaphis ericae siphunculi have a large flange at the end, clearly visible in the micrographs of clarified mounts of an aptera (below first) and an alate (abdomen, below second). 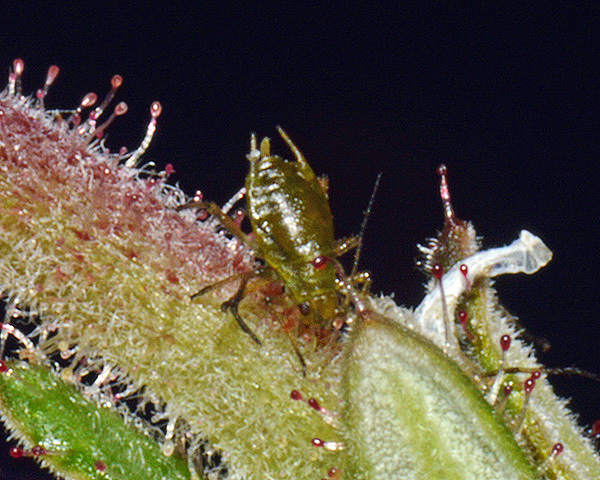 Cross-leaved heath aphids live without host alternation on Erica species, especially cross-leaved heath (Erica tetralix), feeding on flowers and shoot apices. Oviparae and apterous males are produced in September and October. 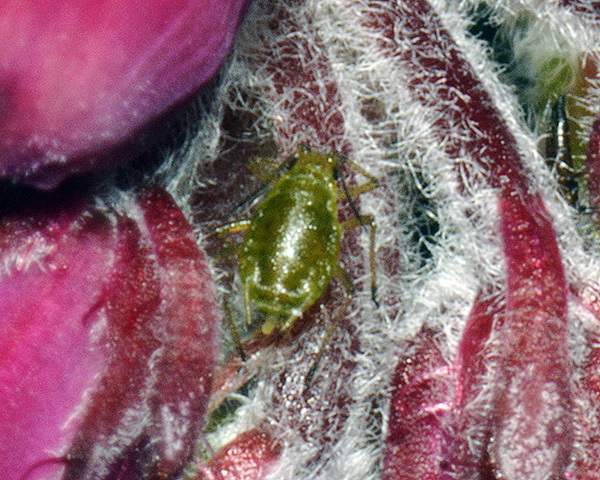 Blackman (2010)) notes that Ericaphis ericae is often overlooked because of its small size and cryptic colouration. It is found in Britain and continental Europe, east to Poland and south to Spain and Portugal. 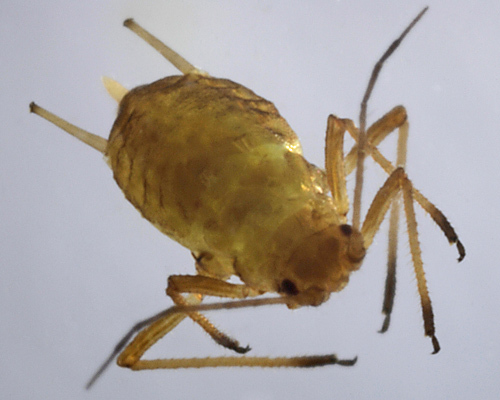 Ericaphis ericae is the only aphid known to feed on cross-leaved heath (Erica tetralix) - but has been recorded from 4 Erica species (Erica australis, Erica caffra, Erica gracilis, Erica tetralix). Blackman & Eastop list 12 species of aphid as feeding on heaths (Erica species) worldwide, and provide formal identification keys. 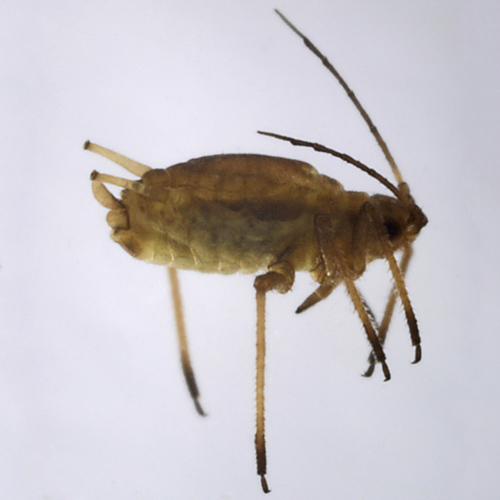 Of those aphid species, Baker (2015) lists 9 as occurring in Britain: Aphis aurantii, Aphis fabae, Aphis gossypii, Aphis spiraecola, Aulacorthum solani, Ericaphis ericae, Ericaphis latifrons, Myzus ornatus and Myzus persicae.